Riding a scooter is easy to learn. No gears or complicated instruments to master — just twist the handlebar and scoot. If you’re comfortable riding a bicycle, you will probably adapt to a scooter quickly. Here in Georgia, as well as some other states, a tag, registration, title and insurance are not required for 50cc motor scooters. A standard driver’s license is required. Motor scooters over 50cc require a tag, registration, title, insurance, and a valid Class M motorcycle license (see Rider's Safety Course below). In Georgia, all scooterists must wear a DOT approved helmet. Click here for Georgia requirements. To find the motor scooter law in other states, click State DMVs. Scooters are simple and easy to ride, but for your safety and to improve your skills, we recommend the Motorcycle Safety Foundation (MSF) Rider Course. This is also the best avenue to earn your Class M license. Twist ‘n’ Scoot has partnered with Chris Carr of Two Wheel Adventures Motorcycle Academy to offer MSF certification classes that will train you on your scooter, unlike most classes which require a motorcycle. 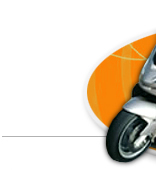 Learn to ride safely; get the training required for a Class M license for scooters over 50cc. To attend a class, you must have a valid motorcycle permit which is easily obtained by taking the written test at the DMV. Participants bring their scooter and appropriate riding gear: helmet, long sleeve shirt, over-the-ankle boots, and gloves. After successfully completing the MSF class, you will receive the course completion card which may entitle you to a waiver from the motorcycle license written examination and road test. Additionally, graduates of TWA classes will receive a coupon good for 10% off any accessory at Twist 'n' Scoot. Find out more and register for a class at Two Wheel Adventures. Chris Carr is a State of Georgia Dept.of Driver Services Motorcycle Safety Program approved training provider and MSF instructor, as well as a DBS dirtbike and ATV coach. He has been actively engaged in motorcycle training and education since 2001. He also served on the American Honda Demo Team. Chris' programs have educated more than 6000 riders in the Atlanta area. Chris has competed in AMA, WERA, Formula USA, and AHRMA road racing events. His book Street Riding Secrets was nominated for Georgia Author of the year. Chris currently writes articles for several motorcycle publications and hosts Two Wheel Adventures Radio on Tuesday nights from 7 to 8pm on Garage 71 station. The Motorcycle Safety Foundation® is the internationally recognized developer of the comprehensive, research-based, Rider Education and Training System (MSF RETS). RETS curricula promotes lifelong-learning for motorcyclists and continuous professional development for certified RiderCoaches and other trainers. MSF also actively participates in government relations, safety research, public awareness campaigns and the provision of technical assistance to state training and licensing programs. The Motorcycle Safety Foundation is a national, not-for-profit organization. Twist ‘n’ Scoot is delighted to announce a partnership with the world leader in car-sharing, Zipcar! On the occasion you need more than your scooter — say a pick-up truck to haul some furniture or a weekend getaway to the mountains in a convertible Mini — car-sharing with Zipcar is the perfect complement to owning a scooter. With Zipcar you can reserve cars by the hour or day, and all reservations include free gas, insurance and 180 miles. Best of all, "friends of Twist ‘n’ Scoot" can join Zipcar for only $25/year — that’s a $50 savings! Join Zipcar today at www.zipcar.com/twistnscoot and get access to over 65 cars throughout Atlanta and 7,000 cars nationwide. In celebration of our new partnership Zipcar is offering $25 in FREE driving credit. * Enter TNS25 in the promo code field of your online application to redeem.